Bake a sheet cake the size that you need. With an icing filled bag and round tip #5 draw Perry on the cake top. Draw a one or two inch border around Perry's shape. See more cakes like this. Cut the cake away from the border shape. You will use the round tip #5 to do all the outline work and the star tip#16 to do the fill in work. Make a dark orange icing and outline the bill and the feet. Also do the inside lines of his tail. 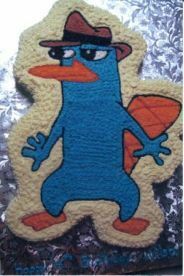 Use a black icing and outline the rest of Perry. Make a light orange icing and fill in the bill, the feet, and the tail. Use the black icing and fill in the black of the eye and the headband of his hat. With white icing fill in the rest of the eyes. Make a medium brown icing and fill in his hat. Now make a medium sky blue icing and fill in his body. I used ivory icing to fill in the border around Perry and the sides of the cake.